Vitamin B1 Rich Indian Foods. Vitamin B1 Rich Indian Recipes. Every nutrient plays some role in keeping us healthy. Some work towards general well-being while others help specific body parts like eyes, skin, hair, muscles, etc. However, due to poor planning of our diet and lifestyle, or due to some abnormal health condition, we often face a deficiency of some nutrients. What is the best way to make up for this shortfall? While some cases might be extreme enough to require nutrition capsules, in most cases mild deficiencies can be easily compensated by a well-planned diet. Here we propose some interesting and tasty recipes, which will help you boost the Vitamin B1 content of your meal. 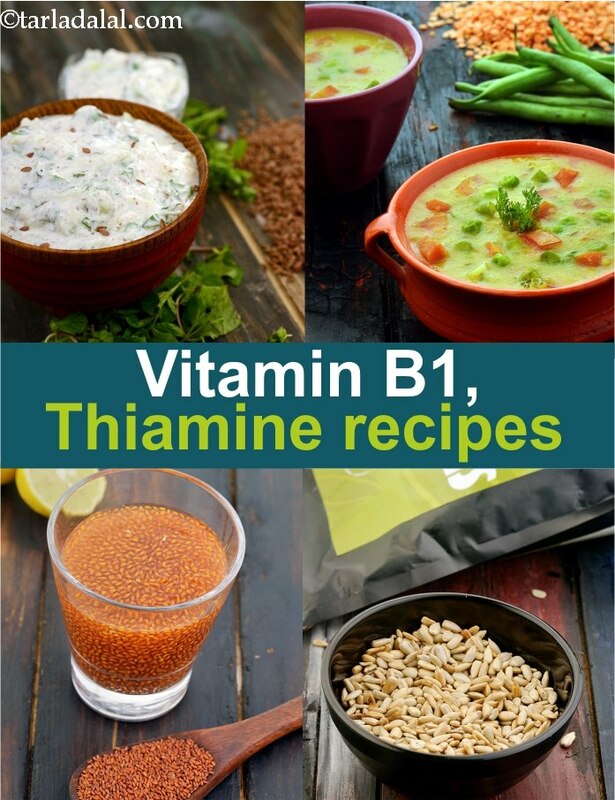 Vitamin B1, thiamin or thiamine is essential for glucose metabolism. It extracts energy from our food and converts it into ATP (adenosine triphosphate), which is the biochemical form in which our body stores and uses energy. Vitamin B1 also maintains proper nerve, muscle and heart function. It is a water-soluble vitamin just like others in the B-vitamin family. 3. Forms ATP (adenosine triphosphate) which body uses for energy. Sounds important, doesn’t it? It is, indeed, as one realises when the level of this vitamin goes low! The recommended daily allowance of Vitamin B1 for an Indian adult male is 1.2 to 1.6 mg per day and for females it is 1.1 to 1.5 mg per day, which increases by 0.2 mg during pregnancy and by 0.3 mg per day for breast-feeding moms. Thiamine deficiency or beriberi can lead to muscle wasting and cardiovascular disease. Symptoms like poor appetite, nerve damage, fatigue, muscle weakness and rapid weight loss could indicate a shortfall of Vitamin B1. This may be caused by alcoholism, vomiting and other gastrointestinal illnesses. When you need a quick top-up, your doctor might suggest a B-complex vitamin supplement, which usually includes vitamin B1 (thiamine), vitamin B2 (riboflavin), vitamin B3 (niacin/niacinamide), vitamin B5 (pantothenic acid), vitamin B6, vitamin B12 and other vitamins that work together to produce energy through effective food absorption. You can improve your Vitamin B1 levels by cleaning up your diet and adding some healthy ingredients to it. Stay away from processed foods, and go for whole grains like Wheat, Jowar, Bajra, Ragi (Nachni), oats, brown ricee, unpolished white rice, rice bran and wheat germ. There are ample vegetarian sources of Vitamin B1, such as colocassia leaves, Capsicum, tomatoes, peas, Almonds, groundnuts, pistachios, Walnuts, Rajma, soya bean, chick peas, Moong, Matki, whole urad and sunflower seeds. Egg is also helpful in boosting Vitamin B1 in your diet. These ingredients can be included in your daily diet in many interesting ways, ranging from a comforting porridge to an exciting salad or snack. We share some of our favourite recipes rich in Vitamin B1. We are sure they will work wonders for your health. Enjoy our Vitamin B1 Rich Indian Foods. Vitamin B1 Rich Indian Recipes and other Vitamin B recipe articles below.